No. 5 & 7, Jalan TK 5/46, Kinrara Industrial Park, 13KM, Jalan Puchong, 47190 Puchong, Selangor, Malaysia. Stainless Hydraulic Connectors (M) Sdn Bhd started out in 1999 as a processing factory. After successfully establishing a niche in this industry, it eventually decided to widen their horizon as they began to manufacture stainless hydraulic fitting and hose fittings in 2005. This move has become a great feat for SHC because it has introduced better hydraulic fittings and couplings product lines with excellent quality service to all its customers. SHC boasts of 20 skilled workers that have become instrumental to the booming production of stainless hydraulic fittings. The manpower of this company has been carefully selected for their highly developed skill sets that stand above the rest. With such valuable workers in SHC, you are surely guaranteed of a competitive stainless steel hose fittings and couplings product line. The hardworking people of SHC are the key facets of the company enabling it to cater to bulk orders at anytime. Precise quality assurance testing has made it possible for the company to produce high quality stainless steel hose fittings and export it to other countries such as Australia, Singapore, Thailand, Philippines, New Zealand and a lot more. The pillar of SHC's success is also due to its quality control. As mentioned, each stainless steel hose fittings and couplings product requires a series of thorough tests before it is released for distribution. From the onset, the raw material undergoes rigorous testing and if it passes, it will be placed in stock as requests are being processed. When this material will be taken out for cutting, quality testing will again take place. The testing does not even end there. When it goes through drilling, CNC machines and even polishing, it is once more tested to make sure quality has been maintained all throughout. With so many testing procedures each product passes through before being handed over to the customer, it is no wonder the stainless steel hose fittings and hydraulic fittings are without doubt of high quality. For almost half a decade, SHC has consistently been providing excellent service to its customers.As a company that functions primarily to give superb customer service in terms of providing quality stainless steel hose fittings and customer service, it is commonplace to find patrons and repeat customers purchasing the products again and again. It is their mission to retain customers by making sure the products are always of high quality and by making available a reliable customer support for anyone who needs assistance. 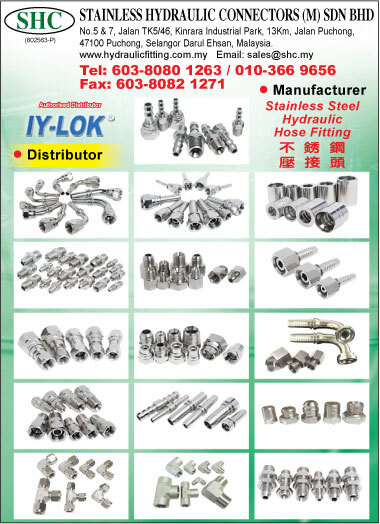 The company always sees to it that customers will not encounter problems with their hydraulic hose fittings and couplings products because it is their goal to set the standards for quality stainless steel hose fittings and stainless hydraulic fittings in the industry. With SHC, you get only the best stainless steel hydraulic hose fittings and couplings products available, as only the finest hydraulic manufacturers can provide. SHC endeavors to consistently provide customer satisfaction by providing only high quality hydraulic fittings and couplings products at competitive rates. If you want to purchase stainless hydraulic fittings and hose fittings and you are looking for something that is worth every penny you spend, you will be in good hands with SHC. As a company that has been around long enough to know that great quality is, you will certainly not be disappointed.